Today I’m starting something new. Instead of just posting on my blog, I’m going to start also posting on a new site I’ve started (with a lot of help from Dan): A Mommy Abroad. 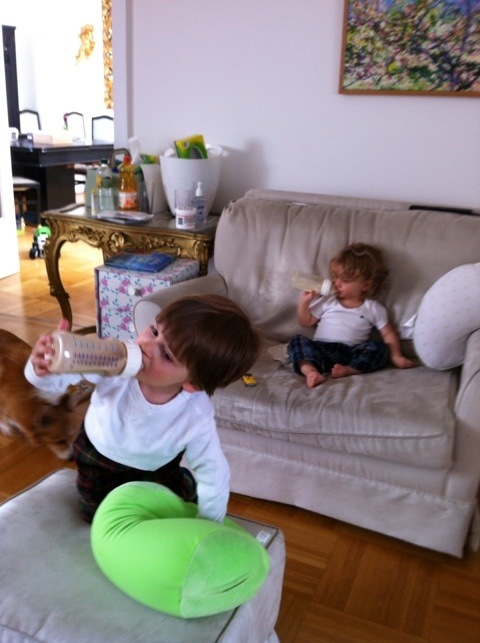 April 6, one year ago, about 8:30 in the morning, we arrived in Vienna. We dragged our amazingly patient kids and our exhausted selves off the plane and through the airport, loaded a cart down with approximately one ton of luggage, found our dog, wandered through customs and deposited ourselves on the sidewalk outside of the Vienna International Airport. It was cloudy and drizzly. It was cold. It was completely overwhelming. We were waiting for a friend of Dan’s (another American ex-pat who I had never met) who had, incredibly kindly and generously, offered to pick us and ALL of our stuff up at the airport. Greg arrived and we managed to wrangle everything (and everyone) into his car. He got us to our place, helped us communicate with the rental agent (who was very nice, but spoke only a little English). I was worried about paying for our temporary place when we arrived — we had paid a deposit, but suspected we’d have to pay in full before we could check in, and we didn’t have an Austrian bank account and had only a few Euros. I was having panicked moments imagining us stranded on the curb with two kids, a dog, a ton of stuff and nowhere to stay. Greg was bemused by my concern. He helped us in with our stuff (as did the rental agent — everyone was tremendously kind and helpful), and then went out and made a run to the market while we got ourselves situated. Greg gave us his grocery bag, since they don’t supply them here, and we didn’t have one. We still have it. We use it every week. 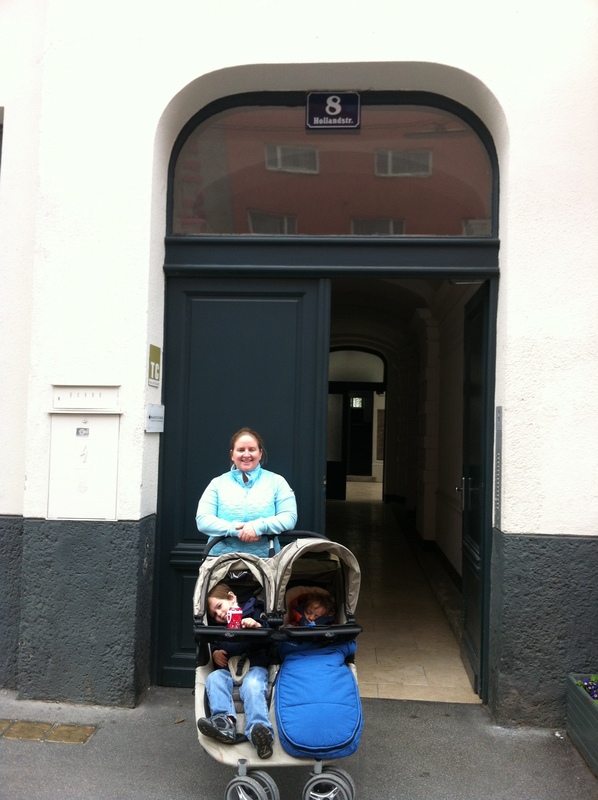 One year after arriving, outside the entrance to our first Vienna apartment. 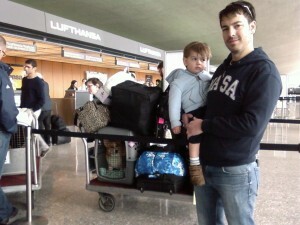 One year ago today we went to Dulles airport, accompanied by most of our family. We had 7 suitcases, a stroller, our dog and our little family. When we departed, we had only arranged for a place to stay for 8 days. We spoke no German. 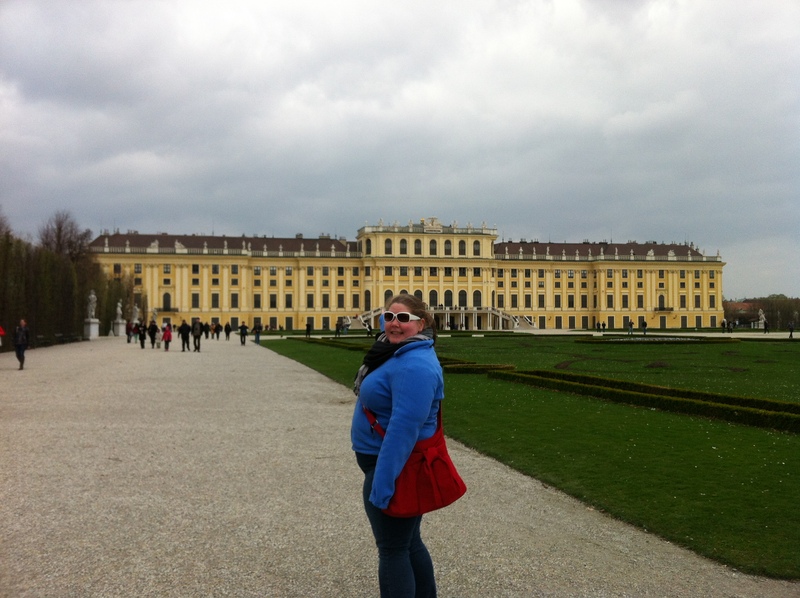 We had only a little money saved, which had to cover our Austrian expenses as well as our home in Virginia. We really had no idea what we were doing or what we were in for. I am still surprised and impressed with myself that I got on that plane. I’m even more surprised by what we’ve accomplished since we’ve been here. Mina went home yesterday. The boys and I escorted her to the airport, partly to make it easier for her to find her way, but mostly because I wanted to be able to be with her for as long as we could. It was hard to say goodbye to her. We had a wonderful time visiting with her. I am so grateful that she came to see us, and I’m so glad that we got to share some of the things that we’re enjoying the most about living here. I miss her. I wish she was still here. We started our day early with breakfast out. We wanted to be sure to introduce Mina to Cafe Landtmann — a place we’ve often enjoyed, especially for their decadent coffees and delectable desserts (even for breakfast), as well as their fantastic location and view of the Burgtheater and Rathaus. We left the house early enough that on the way out, when B got a little too exuberant in the courtyard, we had to remind him that it was early on a Saturday. And when we got to the restaurant, we were among the earliest diners. We enjoyed an excellent breakfast, including breakfast dessert (strawberry tart, truffle cake and even ice cream). It was another pretty quiet day in Mina’s adventure. She joined me in taking B to school this morning, but before we left, as I was grabbing a bite to eat in the kitchen, she looked beyond me, out the window, and exclaimed, “What the heck is going on over at the Rathaus?! ?” Which is weird because we can only see the very top, and unnerving because anytime anyone exclaims about something behind you it triggers a little of a horror movie feeling.